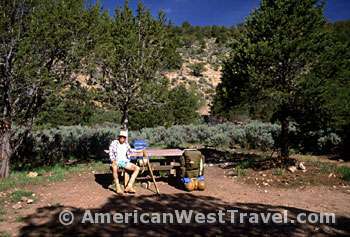 Our last and most exciting Grand Canyon hiking adventure in Grand Canyon National Park took place in Spring, 1990. The original article recounting the trip was written in the 1990s during the early days of the Internet. This revised feature (in 2013) offers more and better quality photos, a PDF map, and a more detailed account of the adventure. Over the years, we had the good fortune of backpacking to the bottom of the Grand Canyon six times. We had started with the popular and relatively easy “tourist” trails such as the Bright Angel, North Kaibab, and South Kaibab, and progressed to steadily more challenging routes each time. One reason was the sense of adventure. Another was that as the park became ever more popular and crowded, you had to get far out in the backcountry to experience “real” wilderness. And perhaps most important was the fascination with the world’s most sublime natural place. When you go below the rim it’s a “world apart”. For some people, it gets in their blood, and the urge to return is very powerful. For our seventh and, to date, last Grand Canyon hiking trip (and in fact last visit to Grand Canyon National Park) we planned a true expedition. Our week-long, sixty mile hike would include secondary trails, routes, and trailless cross country; our most challenging backpacking trip ever. There were some risks. We had not done a serious backpack in several years. The available literature describing the less traveled places was pretty sparse. On previous trips we knew exactly what we were getting into. Not so this time. 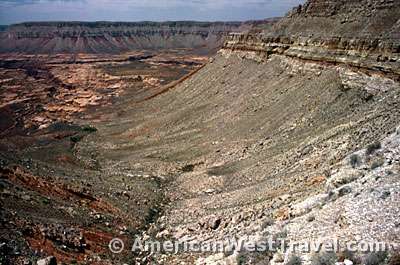 The rangers always warn hikers not to overestimate themselves or underestimate the power of the canyon and its rugged environment. If a hiker gets in trouble on the crowded tourist trails, the worst that usually happens is severe discomfort. If it happens in the wilderness the result is a “Death March” or a “Grand Adventure”, depending on how you look at it. 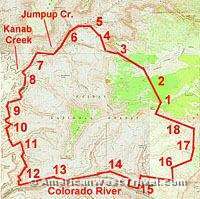 Shown above, left, our starting point at Indian Hollow Campground (point #1 on map below). Located in Kaibab National Forest north and west of the North Rim village, the campground is the trailhead for the Thunder River Trail where we would be exiting the canyon at the end of the trip. This friendly, wooded place gave no inkling to what would follow. We planned to enter the canyon at Sowats Point to hike a huge loop (see map) covering Sowats Canyon, Jumpup Canyon, Kanab Creek, a stretch of the Colorado River, and Deer Creek before finishing on the Thunder River Trail. We hiked cross-country above the ridge behind the picnic table. This eventually leads to the Sowats Point access road (point #2) through Kwagunt Hollow. The biggest challenge was getting past the barbed wire fences left by ranchers. Above, right, a look into Grand Canyon from the Sowats Point trailhead (just past point 3 on the map). The trail switchbacks down to the Esplanade (the first terrace below the rim) on the sand dune in the lower right corner, very strenuous walking with heavily loaded backpacks. Below and right are a map and numbered itinerary for those who wish to follow the details of this adventure. The numbers are referenced in the narrative. 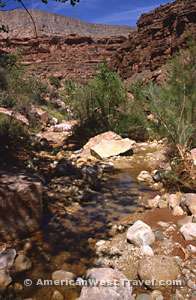 Kanab Creek is a major tributary of the Colorado River located in the northwest section of Grand Canyon National Park. It flows into the Colorado River roughly fifty miles downstream from the Phantom Ranch area which is the focus of visitor activities at the bottom of the Grand Canyon. Starting point at Indian Hollow Campground. Crosscountry to Sowats Point access road. Enter Grand Canyon via Sowats Point Trail. Got lost on Esplanade due to faint trail. Map and compass navigation required to find entry into Sowats Canyon. Entry into Sowats Canyon. First water at nearby Mountain Sheep Spring. Entry into Jumpup Creek canyon. Confluence with Kanab Creek reached on afternoon of second day. Approximate site of Joe’s injury on third day. Most difficult stretch of Kanab Creek. Narrow canyon, obstacles and boulders, difficult stream crossings. Approximate site of Gerry’s injury on fourth day. Easier going in Kanab Creek. Reached confluence with Colorado River on morning of fifth day. Transverse huge boulder field along Colorado River. Most difficult stretch of trip – a true “Death March”. Extremely difficult and exposed hand-to-foot climb and descent of bluff blocking riverside access. Reached Deer Creek Falls after final mile of boulder hopping at the end of sixth day. Exit inner canyon via Deer Creek and Thunder River trails on seventh day. Complete hike back to Indian Hollow Campground via Thunder River trail on the eighth day. Easiest walking of trip. The first inkling of trouble came in the late afternoon on the Esplanade (point 4) when we lost the very faint trail. It crossed a wash, and we simply couldn’t spot where the trail continued on the other side. (Perhaps this was due to first-day fatigue.) 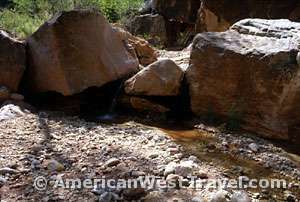 We had taken this faint, roundabout trail because there was a sure source of spring water in Sowats Canyon (point 5). With the temperature over 90°F, you must be sure of getting water. After a futile hour of trying to find the trail, we decided to make a dry camp for the night on the Esplanade. It is a slightly uncomfortable feeling when you are running low on water and don’t know for sure what will happen. We backtracked to a point where the trail was obvious and broke out the map and compass (no GPS in those days). Early next morning we navigated correctly and easily found the trail. With fresh eyes, the cairn marking the trail on the far side of the wash was obvious. We found the (clearly marked) route through the cliff into Sowats Canyon. And, sure enough, there was plentiful water at Mountain Sheep Spring (photo, above left).